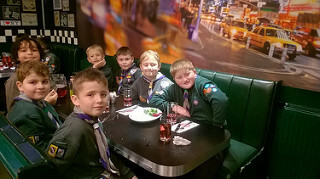 We took 15 Cubs and assorted Leaders for one of our popular afternoon trips, which was to Towcester swimming pool followed by tea at Buddies All American Diner. The Cubs all seemed to enjoy the waves, the flume slide and the various inflatables on offer, as well as the game of water polo organised by the Leaders. It is always nice to watch how the confidence of some of the Cubs grows as the afternoon goes on and the more times they stand in the wave pool or go on the flume slide. After more than two hours in the pool, the Cubs are more than ready for tea as we make the short journey down the road to Buddies. The Cubs always feel very grown up here as they sit at their own tables and order their own meals, with the Leaders keeping a discreet eye on them from a distant table. As always, the staff at Buddies Diner were very welcoming and again, were impressed by the good manners and behaviour of the Cubs.